Sister Marie of Jesus of Ágreda, was one of the big figures of the 17th century, the so called “Golden century of the Baroque”; one century also marked by the decadence and the widespread crisis, of which Spain did not escape. Nevertheless, this was not an obstacle in order that God our Lord was doing his work in the Mother Ágreda. 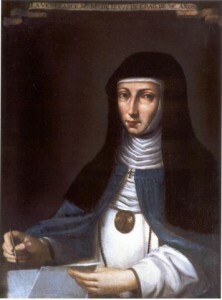 This humble, simple, shy woman, of scanty studies; she would manage to be with the time: adviser of big figures, among them the king Philip IV; evangelizing without going out of her convent, mysticism, abbess, great writer, her more known work is “the Mystical City of God”, in which she narrates the history of the life of the Virgin Mary; also she wrote other works, as her Autobiography, The Spiritual Garden, The Sabatinas, a kind of spiritual diary, and some other works. But, Sister Marie of Jesus of Ágreda was overcoat, a wife in love with God; in all her life the unique thing that she was wishing was to do the agreeable thing to the eyes of The Most High Lord, and for this the Virgin Mary, in her mystery of the Immaculate Conception would be her model to continuing. Would say Sister Maria to the Virgin: “Mother, Lady and my owner, send me as queen, teach me as teacher, correct me as Mother.” To do the God’s will was her delight and for this she would be served of the doctrines that the Virgin Mary was giving her on having written the Mystical City of God. Another manifestation of her great love to God was her love to the neighbor and of there her great worry of that “all the men save and come to the full knowledge of the truth” (1 Tm 2, 4). We invite all those who sail along this Sister’s Web page Marie of Jesus of Ágreda, to know the figure of this exceptional woman and be left to enchant for her captivations, but, especially, be fall in love of her great love in God, in Maria Immaculate and of her love to the neighbors, specially, of most needed from the earth.